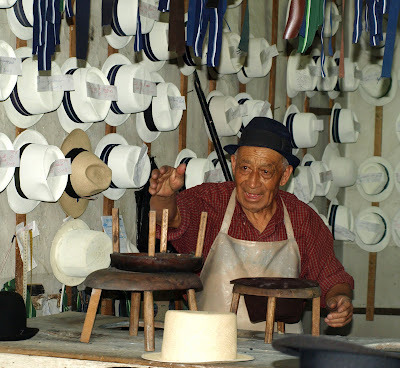 If you thought Panama hats were made in Panama, you're annoying a whole nation of Ecuadorians. They come from Cuenca, a beautiful little city in the south, and wherever you go, you'll see old ladies in short, full skirts with heavy embroidery around the hem, shawls and hats, busily knotting away, a bundle of sun-bleached palm fronds tucked under their arms. 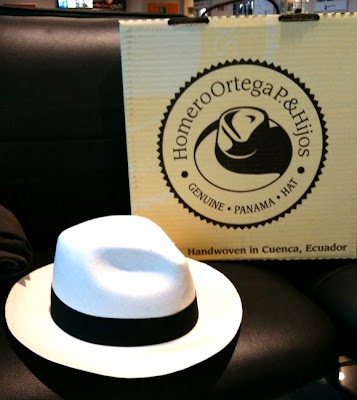 We went to the factory, where all the hand-woven hats are sent to be washed, bleached, steamed and pressed, and sold according to the fineness of the weave - $15 for cheap ones, up to $1000 for the super-fine ones that can be folded without creasing. We all bought some, as they give their wearers a jaunty air. Whether that will go down as well in suburban Auckland remains to be seen. We have in our group a person with a rather large head, whose mission has been to find one to fit him, but even after an extensive search out the back by the girl, he had to come away hatless. "Ecuador - small country, big hearts" (but also small heads). Ah - I thought you were the dot in Cuenca, Pichencha!